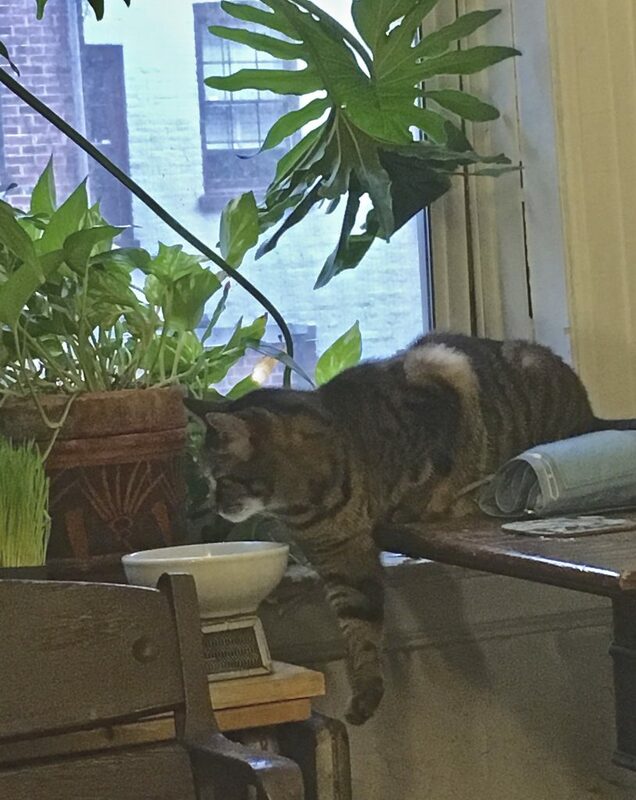 Here is Bella the Cat taking a drink. Note the balletic posture, left shoulder up, right paw crossed over and down for balance as she prepares to stick her snout into the H2O. Shocked, you ask yourself: what evil cat owner would make it this difficult for a kitty to get at her hydration? Well, here’s the thing: this is not her water dish. Her water dish is an ignored object on the kitchen floor. It sits beside her food dish and is refilled every morning with the same fresh water as is in this. THIS is for the plants, to help humidify them. The previous cat, The Late Great Fugazy, never gave it a thought. But from the moment — three days into her residence here — when Bella finally crawled out from under the bed to explore her surroundings, she found the water in this bowl much tastier than the water in her dish. In reality, this is what I think is going on: Bella was a foundling. She was adopted as a kitten by some folks who wanted a friend for their aging cat. Bella, though, was too aggressive — in fact she was so pushy they named her after Bella Abzug. (Now that’s a real NY story, huh?) Finally the older cat was so terrorized she stopped eating, and they decided Bella had to go. So she came here. I think she must have survived on the streets until her adoption by a combination of aggression and sneakiness. Even now she doesn’t like to eat while I’m in the kitchen — if I come in while she’s eating she’ll run away. Otherwise she never avoids me (quite the contrary, e.g. she’s on my lap right now) but while she’s eating she wants to be alone. I think this water ballet business also has to do with making sure those other cats whom she used to have to fight for food on the street can’t sneak up on her while she’s stealing water from the out-of-the-way puddle. I also bet that if I put a food dish up there, that would be her dish of choice, too. Too bad that’s not about to happen. Bella is a beautiful cat, and very cuddly! She was a perfect companion when I stayed with her for a week! Bella looks lot like the kitty who lives with us – coloring tne same and markings similar. But our Haekitty (his name), rescued from the streets of Springfield MO, gets his water by hopping up to the kitchen or bathroom sink and licking the faucet or visiting the shower to lick up the leftover drops- all when he thinks no one is watching. He never touches the bowl of nice, clean water refilled every morning that sits next to his food bowl.